MamaEatsClean: Something to Munch on since I can't have apples..................FODMAPS Friendly Peanut butter cookie dough bites! 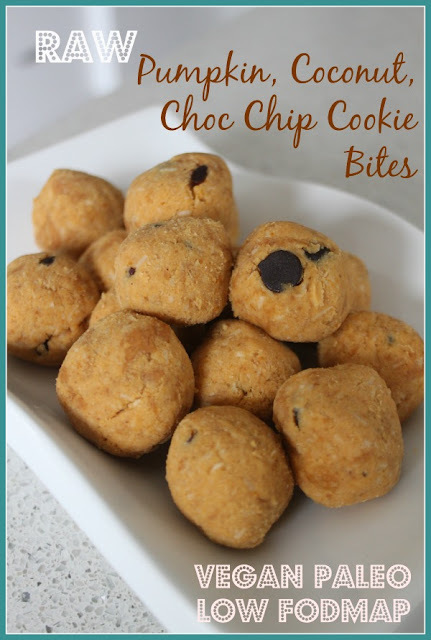 Something to Munch on since I can't have apples..................FODMAPS Friendly Peanut butter cookie dough bites! I had a rough winter with my digestive issues. It was very confusing (and even more frustrating) since I didn't know what more I could possibly do to heal my gut. My stress is low (other than having three kids which is a bit of a circus most days), I eat clean, I've cut out two of the four food groups recommended in the Canada Food Guide (dairy and grains). I'm super strict with my sleep schedule. I don't drink ANY alcohol. Ever. I don't drink any caffeine. Ever. Not even decaf. I take my supplements. After hitting rock bottom on Easter weekend, I went "research crazy". And stumbled across "The Complete Low-Fat Diet" book. It is basically a diet for IBS sufferers. Its categorizes the different types of sugars (certain groups of which can be difficult to digest for people with IBS) and specifies which are high/low in FODMAP's. You basically need to eliminate the foods with high FODMAPS for a few weeks and then you are supposed to re-introduce/test them to see which ones you are sensitive to. 2) This diet WORKS. I was better within 2 days after months of upset (really upset) stomachs. This is not meant to be a long-term diet/lifestyle. But guess what. I'm too scared to go off of it. I enjoy not being sick. I've had a few things in small amounts (beans, garlic powder, onion powder) and I survived. But I'm still not ready to really test it. So in the meantime, I've been keeping these "balls" in my fridge as my snacking options are pretty limited. I make a batch every week. They are easy to whip up and help to keep my fingers out of the cookie jar. If you are eating super healthy and still not feeling great, it might be worth looking into the low-FODMAP diet. There's definitely something to it! Just mix it all together. Roll it into balls (I make them 1 Tbsp each). Store in the fridge. And munch on one (or two or three) when you start looking in the fridge for a snack. Easy to make. Easy to eat.